If you are feeling stuck in your plans; stagnant in your relationship with God; you don’t know how to move forward in life. The Lord has a message for you today through the life of a man who seemed to be the least qualified candidate to teach us how to move forward. He was in prison when he wrote this letter. Being in prison meant not knowing when you would be set free; it also meant that coming out could be for execution. How could you talk about moving forward in life when you are in such condition? Perhaps you are not sure how to move forward in your own situation or circumstances; but hear God’s word through the apostles Paul to learn what needs to happen if you truly want to move forward. V.12-13 Not that I have obtained this….Brothers I do not consider myself yet to have taken hold of it…..But one thing I do: forgetting what is behind and straining toward what lies ahead, I press on toward the goal. Verse 13 tells us about something Paul wanted to obtain but had not yet accomplished. But in order to move forward in accomplishing this goal he needed to do some things. Moving forward requires you to let go of the past. Don’t live in it any longer. (Forgetting what is behind doesn’t mean forgetting the past. You and I can never forget the past; but we can choose not to live in it; you can choose to let it go). (v.4) Paul had more reasons to place confidence in his own efforts than anyone. – A Hebrew of Hebrew from the tribe of Benjamin. – As to righteousness under the law, blameless. He kept the law. He could not be accused not be accused of being a law breaker. Paul was very good in what he did; but look at what he said about his accomplishments in life. (v.7) whatever profit or gain I had from my efforts, I counted as loss for the sake of Christ. – He considered everything a loss compared to the greatness of knowing Jesus. (v8) I count everything as loss because of the surpassing worth of knowing Christ Jesus my Lord. Knowing Jesus and being found in him was more important to Paul than his own heritage, his own religious tradition and his accomplishments. No accomplishment, no religious tradition can compare to knowing Jesus and get your identity in him. This is what Paul mean when he said forgetting what is behind. (His heritage, religious position, zeal for the law, etc.) Those things were behind him and they weren’t going to help him get to the next level. You cannot move forward when you are still relying on your accomplishments or failure. Churches remain stuck when people just want to reminisce about what they used to do or what they had. You cannot get to 2nd base without abandoning 1st base. You must let go of first base if you intend to reach second. You must let go of the past if you want to move forward. Paul wanted the righteousness that came through faith in Jesus Christ rather than his own righteousness. He wanted to know Christ and the power of his resurrection and the fellowship of sharing in his suffering. Paul desired to share in the sufferings of Christ and to also experience the resurrection from the dead. To move forward, you must not live in the past. To move forward you must reach toward what lies ahead. (v.13) This is going to require hard work. Paul used the word “straining toward” or stretching toward” (reaching toward) What is it that you want to reach? It requires you to stretch out to reach it. It requires you to go get it; things will not happen doing nothing. You must make the decision to go get it. Reach for the goal. I press on toward the goal (press on means, to put to flight, to pursue with haste). This is going to demand lots of work and determination. Paul used the same word in verse 12. He has not yet obtained the goal of knowing Jesus and the power of the resurrection as well as sharing in the sufferings of Christ, becoming like Christ in his death, so that he can attain to the resurrection from the death. Moving forward demands commitment to reach for the goal. Paul was so committed, he was pressing on toward the goal. Pursuing the goal with haste. Moving forward requires you to keep your eyes on the prize. This was Paul’s goal, to win the heavenly prize in Christ. Resolutions and goals in life don’t happen automatically, you must be committed to go get them. You must ask yourself how bad do I really want this? Moving forward in life won’t happen when you are still stuck in the past experiences, or accomplishments or what you used to be or do. You must let those things behind, you must let go of that mindset because it won’t help you to take you to the next level. People want to move forward in life, but they don’t want to let leave the past behind them. Their identity is wrapped around who they used to be or what they used to do. Paul did not let the past affect him because his goal was Jesus (knowledge of Jesus, the power of his resurrection, sharing in his suffering. Becoming like Jesus in death and life). He said forgetting what is behind, and straining to what lies ahead. Moving forward requires you to press on toward the mission. You must press on toward what you want to accomplish. It may not come easily but how determined are you to go after it? Moving forward demands your focusing on the goal to obtain the prize. Athletes focus on the gold medal or the championship when they compete. They train their bodies, so they can endure the race all the way to obtain the prize. 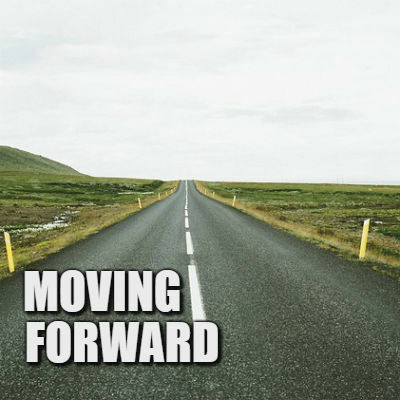 What is keeping you from moving forward? Is it the past? What is distracting you from focusing on the mission? Not enough determination to press on toward the goal? 2 Tim.4:6-7For I am already being poured out as a drink offering, and the time of my departure has come. 7I have fought the good fight, I have finished the race, I have kept the faith. 8Henceforth there is laid up for me the crown of righteousness, which the Lord, the righteous judge, will award to me on that day, and not only to me but also to all who have loved his appearing.